This article is about the book. For other uses, see Venus in Furs (disambiguation). 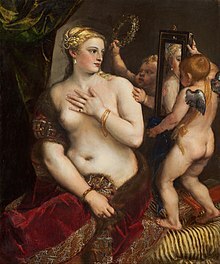 The Titian painting Venus with a Mirror, from which Severin gets the idea of Venus in furs. The novel draws themes, like female dominance and sadomasochism, and character inspiration heavily from Sacher-Masoch's own life. Wanda von Dunajew, the novel's central female character, was modelled after Fanny Pistor, who was an emerging literary writer. The two met when Pistor contacted Sacher-Masoch, under the assumed name and fictitious title of Baroness Bogdanoff, for suggestions on improving her writing to make it suitable for publication. The framing story concerns a man who dreams of speaking to Venus about love while she wears furs. The unnamed narrator tells his dreams to a friend, Severin, who tells him how to break himself of his fascination with cruel women by reading a manuscript, Memoirs of a Suprasensual Man. Severin describes his feelings during these experiences as suprasensuality. Severin and Wanda travel to Florence. Along the way, Severin takes the generic Russian servant's name of "Gregor" and the role of Wanda's servant. In Florence, Wanda treats him brutally as a servant, and recruits a trio of African women to dominate him. That woman, as nature has created her, and man at present is educating her, is man's enemy. She can only be his slave or his despot, but never his companion. This she can become only when she has the same rights as he and is his equal in education and work. The Velvet Underground's 1967 debut album The Velvet Underground & Nico included the song "Venus in Furs". The 1992 feature film Swoon opens with Richard Loeb performing a dramatic reading of Venus in Furs with the assistance of several women and drag queens. The novel has been adapted for film several times: in 1967; in 1969 by Massimo Dallamano; in 1969 by Jesus Franco; in 1985 as Seduction: The Cruel Woman (Verführung: Die Grausame Frau), a lesbian-feminist interpretation directed by Monika Treut; and in 1995. Venus in Furs was a fictitious band who performed in the 1998 British-American drama film Velvet Goldmine. Steve Tanner adapted the novel to stage. In May 2004, it premiered in Los Angeles at the Sacred Fools Theater Company as part of its "Get Lit!" series. The book inspired Venus in Fur, a 2010 play set in the modern day by David Ives, which had its Off-Broadway premiere at the Classic Stage Company in New York City starring Nina Arianda and Wes Bentley. In 2013, Roman Polanski directed the film Venus in Fur (original French title La Vénus à la fourrure), which is based on the David Ives play. The film premiered in competition for the Palme d'Or at the 2013 Cannes Film Festival and in January 2014 it won the Best Director award at the 39th César Awards. ^ McNulty, Charles (2014-10-13). "Venus in Fur is a delicious study of sexual power dynamics". Los Angeles Times. ISSN 0458-3035. Retrieved 2017-10-31. ^ Romney, Jonathan (2014-05-31). "Venus in Fur review – Polanski's witty take on sexual politics". The Observer. ISSN 0029-7712. Retrieved 2017-10-31. ^ "Roman Polanski to Serve as President of France's Cesar Awards". The Hollywood Reporter. Retrieved 2017-10-31.